According to my fiancé (yes we got engaged! And yes, he’s not a healthcare guy. In fact, he’s scared of needles), when he hears the word delirium, he thinks of someone being delirious or confused. Unfortunately, this state happens a lot in the ICU and causes a lot of problems. You can go from being a crazy beast, pulling everything to being super quiet, not making eye contact to someone’s voice. 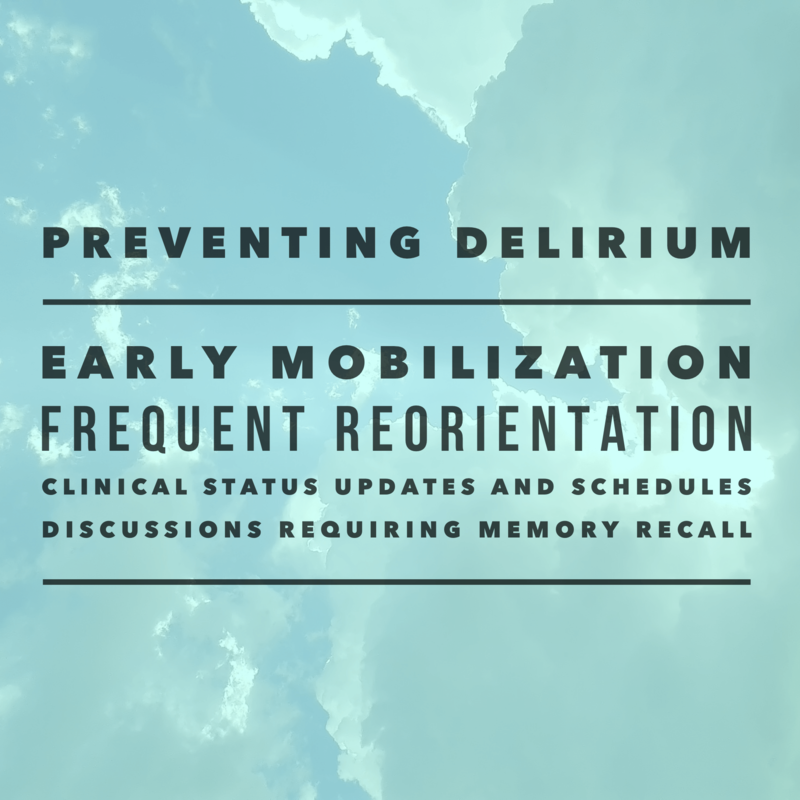 What are the potential causes of delirium and what interventions can be done? Use THINK. 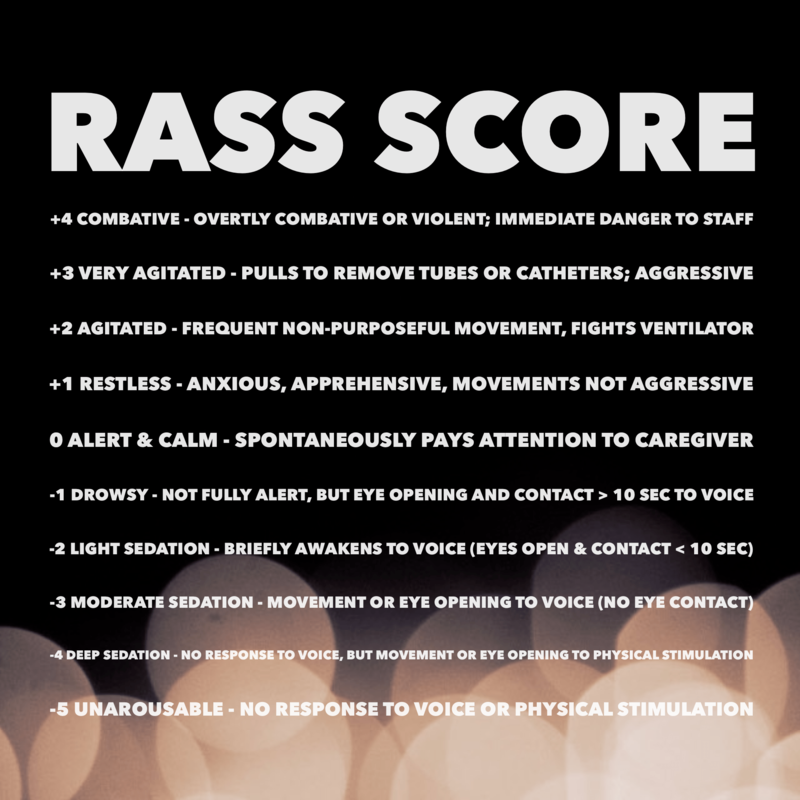 The Gold Standard to determine’s someone state is called the RASS score, or the Richmond Agitation-Sedation Scale. It goes from +4 to -5, as listed below. In conjunction with this, utilizing the Confusion Assessment Method for the ICU (CAM-ICU) determines if delirium is present. 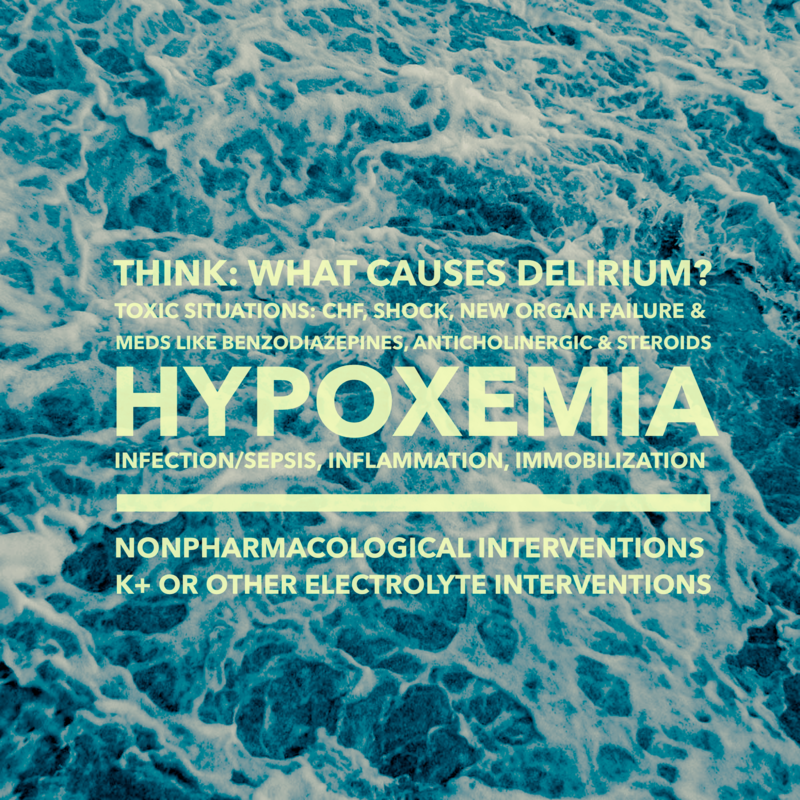 A lot of times we are using medications for agitation and sedation but studies are showing that using multiple non pharmaceutical methods decreased delirium by 15%. Clinical status updates and schedules. Discuss patient requiring memory recall. To me, when I read that list, I think most of it is pretty easy. Except for early mobilization. From what I’ve heard, there are patients who are intubated sitting in a chair! In my current ICU, that does not happen. The biggest concern is the stability of the patient. So what can we do? which stands of Awakening and Breathing Coordination, Delirium Monitoring and Management, and Early Mobility. It incorporates the best available evidence related to delirium, immobility, sedation/analgesia, and ventilator management in the ICU. For the ABC Bundle, the nurse and respiratory therapist will go through his or her checklist before the trial. Is patient receiving a sedative infusion for active seizures? Is patient receiving a sedative infusion for alcohol withdrawal? Is patient receiving a paralytic agent (neuromuscular blockade)? Is patient’s score on the Richmond Agitation Sedation Scale (RASS) >2? Is there documentation of myocardial ischemia in the past 24 hours? Is patient’s intracranial pressure (ICP) >20 mm Hg? Is patient receiving sedative medications in an attempt to control intracranial pressure? Is patient currently receiving extracorporeal membrane oxygenation (ECMO)? If the answer is yes to any of the above, then there needs to be a discussion with the interdisciplinary team before performing a SAT. If the answer is no to all of the above, then proceed with performing the SAT. Stop the sedation. If the following occurs, you should put the patient back on sedation but try at 1/3 to 1/2 the rate the patient was on before. If possible, changing the sedation from propofol to precedex will help patient be calm and it does not depress respiratory status (especially after 24 hours). Spontaneous Breathing Trials (SBT) are up next. The respiratory therapist will assess for safety. Is patient a long-term/ventilator-dependent patient? Is patient’s pulse oximetry reading <88%? Is patient’s fraction of inspired oxygen (FIO2) >50%? Is patient’s set positive end-expiratory pressure (PEEP) >7 cm H2O? Is patient’s ICP >20 mm Hg? Is patient receiving mechanical ventilation in an attempt to control ICP? Is the patient currently taking vasopressor medications? Does the patient lack inspiratory effort? If the answer is yes to any of the above, then it may not be safe to perform the SBT. If the answer is no to all of the above, then the SBT is performed. However, if any of the below occurs indicating signs of failure, then stop. And of course, who is watching for these symptoms? The registered nurses. This refers to the coordination mostly between the respiratory therapist and the nurse, although the discussion during the interdisciplinary team will also play a part. THINK about the causes, use the RASS score every 4 hours and the CAM-ICU score every shift. E stands for Early Mobility. 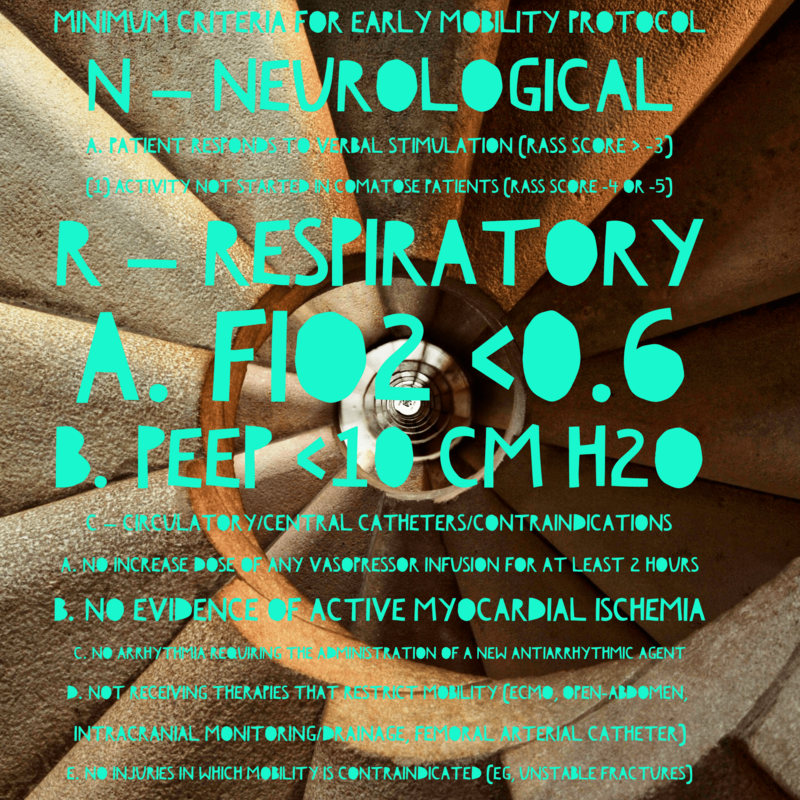 What I’m interested in is the minimum criteria for early mobility protocol. However, if there’s any patient distress, then it’s time to stop. Below are the criteria for stopping early mobility. It’s hard to start something new as an individual as it requires a cultural change and the healthcare team to be behind it. 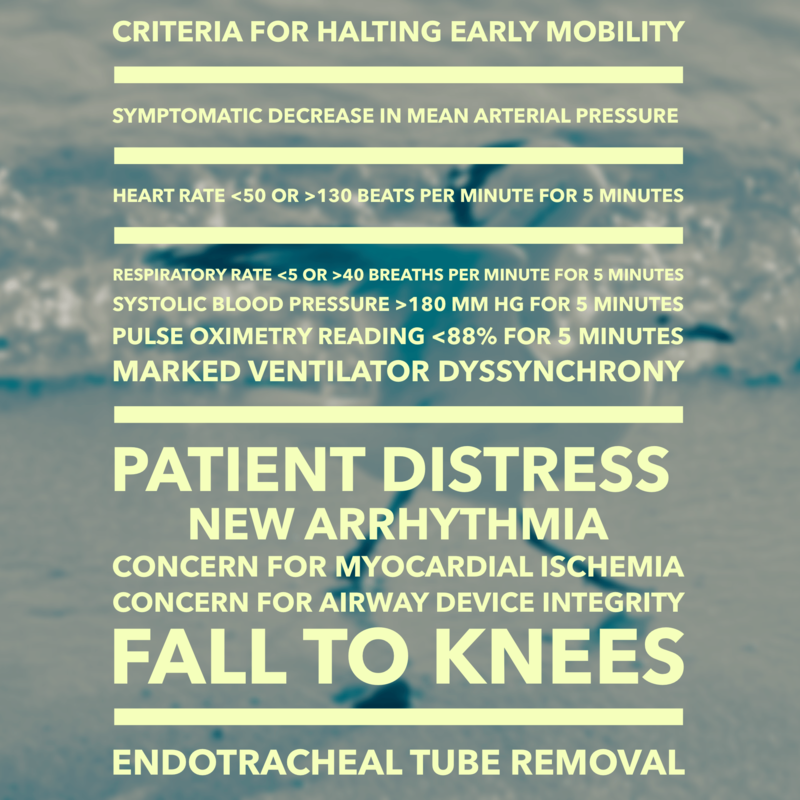 But maybe the next time you take care of a ventilated patient, you’ll think of the ABCDE bundle and implement it as a part of your care. Posted in Evidence Based Practice, ICU Nursing.